Any high school in America has a group of people who love video games and talk about them obsessively. Counter strike is one of those rare games that many, not just geeky computer people, rant about. 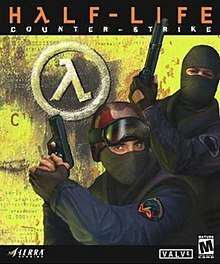 Counter Strike is a mod, a modification to a large game and in this case, Half-Life. The game is totally online (no subscription fee) and pits Counter_terrorists against terrorists. The graphics of Half Life: Counter Strike are, well, bad. This game was first created in 1998 so, the graphics are dated. Be sure to look for the blockly blood effects and the boring character models. I give it a C+. To make up for the terrible graphics, Counter Strike boasts amazing sounds. To be truly successful in Counter Strike, you need to open your ears to 3d sound effects so you can locate nearby terrorists. Characters also let out a moan of pain when shot, which does add some realism to the field. I give it a B. This section is going to be really short. If you have played other first person shooters, you will be at home. Be prepared to be awful the first few times you log on to a server though. Some people have \'Skillz\'. I give it an A. Though the game completely revolves around the fact your team wins when the other team is destroyed. Blood flies in large amounts; especially when a bullet grazes a player\'s head. Because this is an online title, many players swear and use fowl words. I give it a C+. Overall, Counter Strike is a fun, fast- paced, online gun blaze that has more replay factor than could be imagined. I award Counter Strike a 90 out of 100!